HydroCAD is a stormwater modeling program that lets civil engineers design stormwater runoffs in different areas. It is an intuitive, stable, and user-friendly tool that users can utilize confidently in generating results that can save lives and infrastructure. With HydroCAD, teams can rest assured that they can gain an adequate ROI. Since it has a gentle learning curve, users can familiarize themselves with its tools and functionalities to better conduct their tasks and for the swifter completion of projects. Plus, HydroCAD combines TR-20, TR-55, and SBUH methods with multiple built-in powerful features. This makes it a very capable stormwater modeling application as it offers the benefits of CAD as applied to hydrology. With HydroCAD, users can easily see the connections between subattachments, reaches, and ponds. This abstracts the need to manually create a flow diagram and makes routing more expedient. Plus, the application produces automatic diversions as well as hydrographs based on the generated diagrams. HydroCAD enables users to download local rainfall into the system and to run custom synthetic rainfalls as well. This lets them see how their models react to varying rainfalls to ensure that their system holds regardless of the amount of rainwater. Additionally, HydroCAD offers users the ability to manage rainfall information in varying formats, such as in tabular or graphical modes. This lets users seamlessly create unique rainfall and storm definitions to test the integrity of their models. Adding data into the HydroCAD system is a smooth process. This is facilitated by table editing tools and spreadsheet files loading and saving, among others. This lets users better handle daily tasks while advanced options enable them to handle unique situations. HydroCAD instantly generates reports and graphics on-screen that are always ready to be printed. These multi-page reports are automatically formatted with page headings, page numbers, and version numbers and dates for stress-free understanding and ingestion of information. If you are interested in HydroCAD it may also be beneficial to investigate other subcategories of Best CAD Software gathered in our database of B2B software reviews. There are well-liked and widely used applications in each software category. But are they essentially the best fit for your company’s special wants? A popular software solution may have thousands of users, but does it present what you need? For this reason, do not blindly invest in popular systems. Read at least a few HydroCAD reviews and think about the elements that you wish to have in the software such as the price, main tools, available integrations etc. Then, select a few apps that fit your needs. Try out the free trials of these platforms, read online comments, get explanations from the seller, and do your homework thoroughly. This profound homework is sure to assist you choose the best software platform for your firm’s specific needs. How Much Does HydroCAD Cost? HydroCAD offers the following plans, as well as permanent licenses and metered use enterprise pricing. For more information, contact sales by phone or email. We realize that when you make a decision to buy CAD Software it’s important not only to see how experts evaluate it in their reviews, but also to find out if the real people and companies that buy it are actually satisfied with the product. That’s why we’ve created our behavior-based Customer Satisfaction Algorithm™ that gathers customer reviews, comments and HydroCAD reviews across a wide range of social media sites. The data is then presented in an easy to digest form showing how many people had positive and negative experience with HydroCAD. With that information at hand you should be equipped to make an informed buying decision that you won’t regret. What are HydroCAD pricing details? 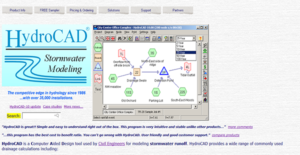 What integrations are available for HydroCAD? If you need more information about HydroCAD or you simply have a question let us know what you need and we’ll forward your request directly to the vendor.